The Jewellery and Watch section of our Fine Sales offers the very best jewellery and most valuable watches that come through our Jewellery and Watches department for auction. 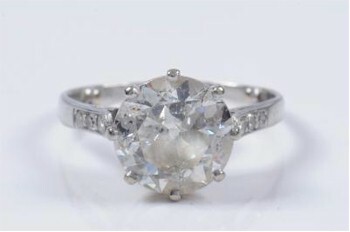 Although the jewellery and watch section is part of the fine sale, it offers a discrete jewellery auction and watch auction in its own right. The Diamond Mounted Single Stone Ring (FS17/319) that realised £4,400 in our three day January 2013 Fine Sale is typical of the jewellery being offered in the Jewellery and Watches section of our Fine Sales. The jewellery and watch section of the sale usually offers several hundred lots of high quality jewellery from various periods and jewellers as well as fine watches from early watch makers to more recent manufacturers.